HALIFAX, Oct. 18, 2017 /CNW/ - When Macdonald Chisholm Trask Insurance (MCT), one of Atlantic Canada's largest insurance brokerages, teams up with Economical Insurance on MCT Day to raise funds for charity, good things happen. This year, their partnership raised more than $25,500 for the Victorian Order of Nurses, a critical part of health care services in the numerous communities where MCT has offices in Atlantic Canada. 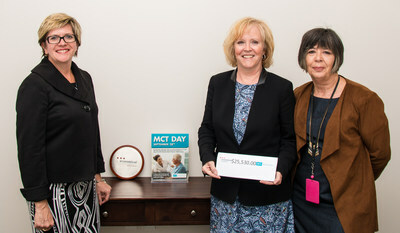 Every year for the past five years, MCT has hosted MCT Day, its largest annual fundraising initiative, in partnership with Economical, one of Canada's leading providers of home, auto and business insurance. Leading up to MCT Day, brokerage staff throughout Atlantic Canada sold 1,850 tickets to win a $5,000 travel voucher from Maritime Travel. The lucky winner was Kathy Atwood of Barrington Passage, NS. In Bedford, staff held a Washer Toss Tournament and a dessert cook-off at which MCT and Economical staff brought their best dessert and people paid $5 to taste and judge the best of the lot. Elsewhere in Atlantic Canada, MCT staff was joined by Economical employees at local BBQs, bake sales and bottle drives to raise funds for the VON. "MCT Day is an opportunity for MCT Insurance and Economical Insurance to show support and appreciation of organizations that help those in need," said Liz Cosgrove, Head of Atlantic Canada for MCT. "Over the years, MCT has raised funds for the IWK Heath Centre and KidSport. This year, our employees selected the VON, which provides home and community care every day in our communities. We're grateful to Economical Insurance, our employees and communities for their time, energy and dedication in making fundraising initiatives for the VON a success. Giving back is a team effort." "We are honoured to have been selected as MCT's cause of choice this year," said Jo-Anne Poirier, President and CEO, VON Canada. "This partnership injects critical funds to support VON investment in innovative approaches to delivering care, and will have a direct impact on those we serve. The funds will support safety and assistive devices and kits that reduce risk for our clients and service providers, and will boost our ability to invest in time-saving technology that allows our service providers to spend more of their time with clients. MCT's support will also enable investment in important leadership training for our teams, once again with a focus on delivering exemplary care to those we serve." "We are delighted to partner with MCT every year to give back to the communities where we live and work," said Karen Kaminska, Regional Vice-President of Atlantic Canada for Economical Insurance. "This partnership highlights the depth and quality of our relationship with MCT that benefits our customers and the communities we are so proud to support." Macdonald Chisholm Trask Insurance (MCT) is a progressive insurance brokerage dating back over 70 years with a tradition of building long-lasting relationships with customers and local communities. With over 135 insurance professionals in 18 urban and rural offices, MCT is one of the largest brokerages in Atlantic Canada. MCT is a BrokerLink company. The BrokerLink companies are subsidiaries of Intact Financial Corporation (TSX: IFC) and affiliated with Intact Insurance Company, Novex Insurance Company and Jevco Insurance Company. Founded in 1871, Economical is one of Canada's leading property and casualty insurers, with more than $2.2 billion in annualized premium volume and more than $5.5 billion in assets as at June 30, 2017. Based in Waterloo, this Canadian-owned and operated company services the insurance needs of more than one million customers across the country. Economical conducts business under the following brands: Economical Insurance, Economical, Western General, Economical Select, Perth Insurance, Sonnet, Petsecure, Economical Financial, and Family Insurance Solutions.